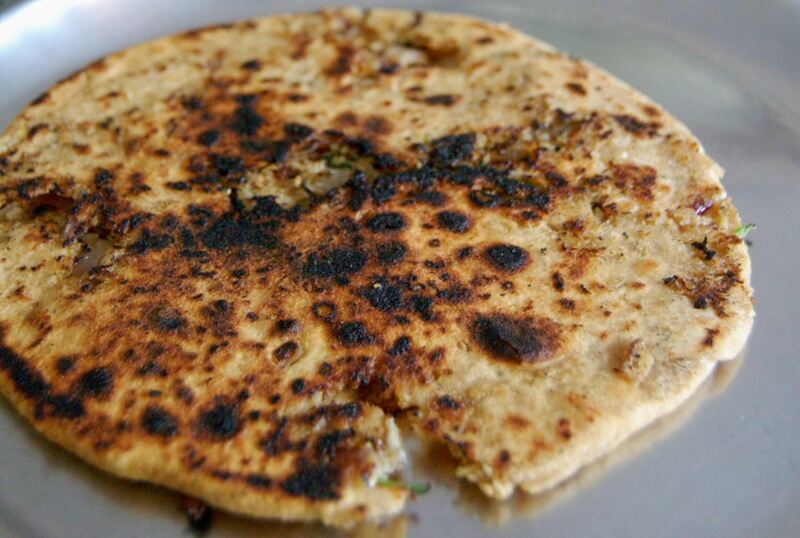 A Paratha is an unleavened, pan-fried Indian flatbread. Once you know how to make the basic one (for which you will find a step-by-step photo guide below) you can fill it with any stuffing you like! You can even add ingredients to the dough while kneading o end up with some really tasty versions of the basic Paratha! Team Parathas (plain or stuffed) with yogurt and pickle and you're in business! Parathas (pan-fried Indian flatbread) are for when you want to spoil yourself! Crispy and flaky, they go well with most Indian dishes be it a gravied curry or a dry stir-fry. Learn how to make them with this step-by-step photo tutorial. Extremely popular with North Indians, these are best eaten with chilled yogurt and your favorite pickle or chutney. Want to be naughty? Aaloo parathas taste delicious with fresh, thick cream or a knob of unsalted, homemade butter! This style of paratha turns out crispy and with several layers. It is the perfect accompaniment for any thick-gravied dish. Healthy and yummy all in one neat little package! What more can you ask for? Serve Methi Parathas with chilled yogurt and a pickle of your choice. This delicious and nutritious Indian bread tastes great with yogurt and Aam Ka Achaar (mango pickle) or Andhra Tomato Pickle. Made Masala Kheema (spicy minced meat) and got some left over? Make Kheema Parathas then. It's meat and bread all rolled into one! I love these easy to make Parathas (pan-fried flatbread) and often eat them with pickle and yogurt! You can also serve them as an accompaniment to any main course vegetarian or non-vegetarian dish. Make a meal of this wholesome and tasty Mughlai-style stuffed bread. Serve it with your favorite chutney.